The system for logging in, viewing historic data, and registering with the Leaf Pack Network is currently unavailable. We apologize for any inconvenience. We are working to bring it back (better than ever!) by fall. Please contact the webmaster with any questions. Thank you for your patience! 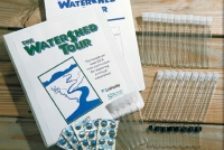 We have set up a temporary way for you to enter and view new data and to calculate your water quality score. See the Data page for details.